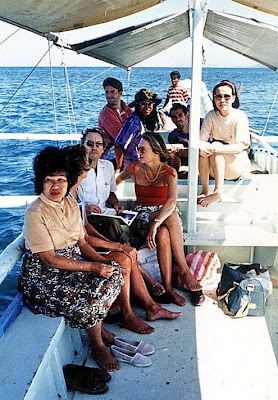 After my trial dive, we booked ourselves on an optional half-day tour of Calauit Island Game Reserve and Wildlife Sanctuary, located just off Busuanga Island’s northwestern coast and opened to tourists since 1985. Cost, including permit and boat ride, was to set us back US$30 per person. We left right after lunch at the resort. 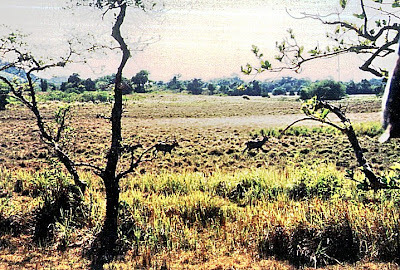 This 3,700-hectare, DENR-administered Strict Nature Reserve was, in response to an appeal made by the International Union of Conservation of Nature (IUCN), was established as a repository for 108 African animals endangered by the 1977 drought and Kenya’s civil war on August 1976 by virtue of Presidential Proclamation No. 1578 issued by the late Pres. Ferdinand Marcos. Its original 250 island families were relocated, 40 kms. away, to Halsey Island and compensated with land titles. Since 1994, it was managed by the Office of Palawan Council for Sustainable Development, a government body dealing with environmental issues in Palawan. We, together with other resort guests, left the resort by 1 PM on the resort’s motorized outrigger boat. The trip took about 45 mins. Upon arrival, we first logged in at the sanctuary’s office. 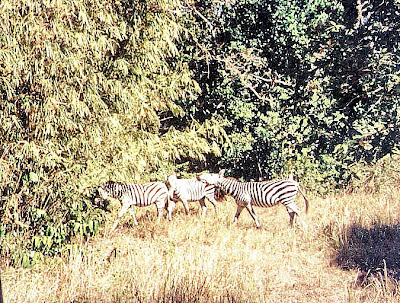 Then, accompanied by a guide, we ushered to the back of the sanctuary’s only “safari” vehicle, a converted 6 x 6 truck which resembled a huge open cage. From our slow-moving and somewhat dilapidated truck, we got up close and personal with these herbivores as some fed near the road we were traveling while zebras grazed under shading trees. Bushbucks (Tragelaphus sylvaticus), Grévy’s zebra (Equus grevyi), Common Eland (Taurotragus oryx), Topi (Damaliscus lunatus jimela), Impala (Aepyceros melampus), Thomson’s gazelle (Eudorcas thomsonii), Reticulated Giraffe (Giraffa camelopardalis reticulata) and Waterbuck (Kobus ellipsiprymnus) can be seen, in pairs or in groups, as they feed or gracefully gallop at the sign of our presence. 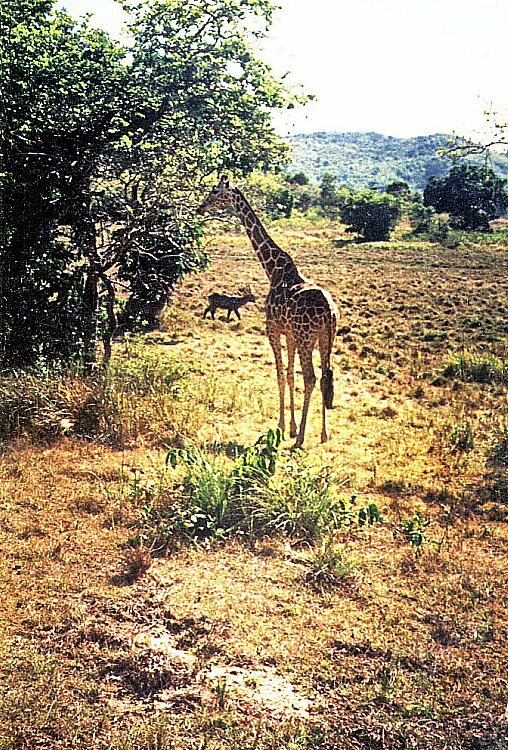 Graceful giraffes, with their somewhat shorter necks (maybe because trees here are shorter), were unmindful of our presence as they continued feasting on the branches of their favorite acacia trees. Our vehicle halted when these tall “jaywalkers” crossed the road. Others stayed put for a short while as if purposely posing for our cameras. Too bad we weren’t able to bond or interact with the giraffes by feeding them (it is discouraged), truly a highlight of any trip to the sanctuary. Such an experience would probably come second to swimming beside a whale shark or butanding off Donsol (Sorsogon). 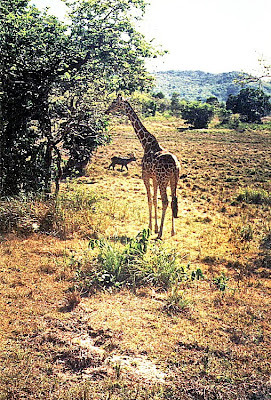 From the original 108 African animals brought here in 1977, 3 or 4 generations of offspring have increased the animal population to 570 heads comprising 8 species, all herbivorous. At the time of our visit, there were now 43 giraffes, 155 impalas, two Thompson gazelles, 122 water bucks, 78 zebras, 50 elands, 14 topis and 16 bushbucks. 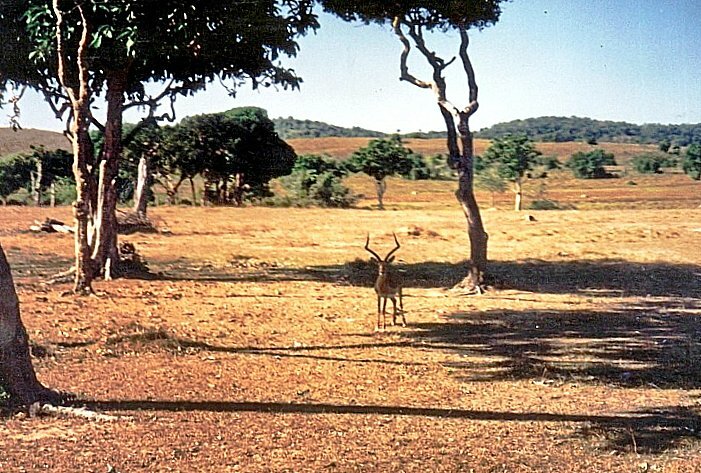 Together with indigenous animals, they range freely around the island in an environment that loosely approximates their original environment. 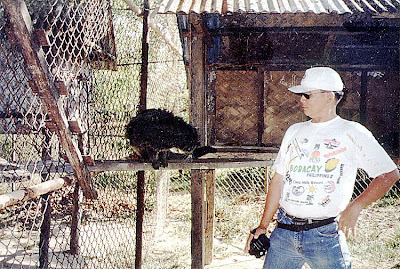 The guided tour includes stops at pens holding many of Palawan’s indigenous species. The sanctuary has saved from extinction, by successfully breeding in captivity, the foot-high The Philippine mouse-deer (Tragulus nigricans) or pilanduk, the smallest hoofed animal found in Asia; the largely nocturnal and endangered Calamian Deer (Hyelaphus calamianensis) and the Philippine reshwater crocodile (Crocodylus mindorensis) which now lives along the mangrove swamps. 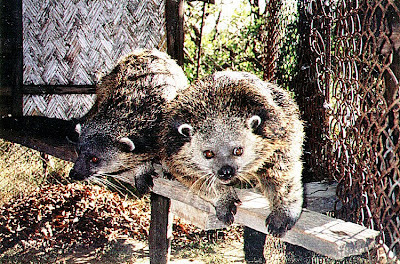 Also bred in captivity are the Palawan bearcat or Binturong (Arctictis binturong), Palawan bearded pig (Sus ahoenobarbus), tarsier or mago (Tarsius philippensis), scaly anteater or balintong (Manis javanica), leopard cat or maral (Felis bengalensis), Philippine porcupine (Hystrix pumila) or landak/duryan and monitor lizard (Varanus salvator). 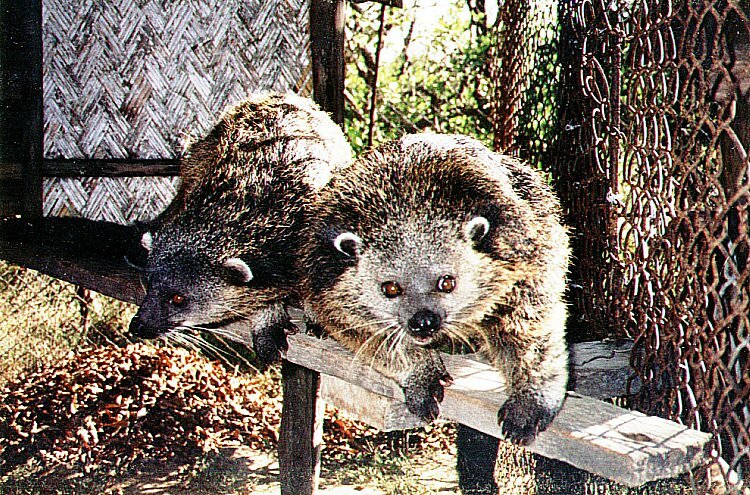 I had a very close encounter with a forever hungry binturong. Too close, in fact, that he snarled when I tried to feed him a banana. There are also over 120 species of birds, endemic and transient and, as a boon to birdwatching enthusiasts, the personnel here are quite capable of identifying these birds. There are also protected rearing and egg-laying areas for giant sea turtles or pawikan (Chelonia mydas). The project also includes a 7-km. marine sanctuary which protects the highly endangered 16-20 dugongs or sea cows (Dugong dugon) that feed along the offshore sea grass beds, and 7 species of clams including what is believed to be the largest live giant clam shell (Tridacna gigas) in the world which weighs as much as 300 kgs.. As fishing is prohibited, commercial fishes, crabs and lobsters now breed here in undisturbed . The coral reefs around the island have shown a 75% recovery rate. This entry was posted in Animal Bonding, Island Hopping, Palawan, Philippines, Republic of the, Sightseeing by Benjie Layug. Bookmark the permalink.